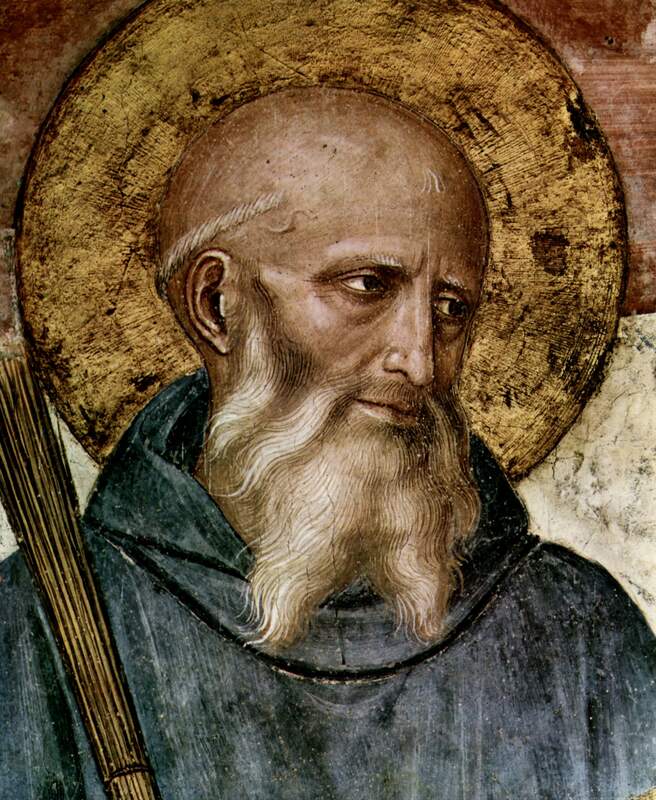 Now, if you’re excited about the Rule of St Benedict, besides applying the lessons about prayer, community, and humility to your own life, you may be wondering where to turn next. After all, RB is pretty short. Where else within that tradition might one go? Well, of course, the fountainhead of all Christian tradition is never to be neglected; that is — read your Bible! (Like a Benedictine?1) Another alternative that I heartily endorse is to read St Benedict’s reading list and contemporaries — so John Cassian, The Rule of the Master, St Basil of Caesarea, as well as the likes of St Columba, Boethius, Cassiodorus, Julianus Pomerius. The alternative I propose today, however, is to consider the tradition that flows forth from RB and those who live according to the Rule. This embraces more than those with O.S.B. (Ordo Sancti Benedicti) after their name, but also those who pre-date the organised congregations of Benedictine monachism as well as the other orders, such as Cistercians, who follow St Benedict’s Rule. The Venerable St Bede (672-735). Bede was a monk here in the Northeast of England, at the monasteries of Wearmouth and Jarrow, spending the last five decades of his life at Jarrow. Most famously, he wrote the Ecclesiastical History of the English People; well worth a read. In Penguin’s The Age of Bede, you can also read his Lives of the Abbots and his Lives of St Cuthbert (besides an unrelated text, The Voyage of Brendan!). If Benedictine biblical reading is your desire, he compiled/composed various commentaries, such as on Genesis, Revelation; from Cistercian Publications, you can get the following in English: the catholic epistles, the Gospels, the letters of St Paul, and Acts. He wrote other biblical studies as well as a range of writings on computus and chronology. He is a Benedictine worth knowing. Blessed Alcuin of York (735-804). The great Carolingian scholar from England wrote widely and helped revise the text of the Vulgate Bible. I’ve read a number of his prayers in Sister Benedicta’s anthology Christ Beside Me, as well as some of his verse. I’d like to read more, such as his letters. St Anselm of Canterbury and Bec (1033-1109). St Anselm, from Aosta in Italy, spent his monastic career at Bec in Normandy before being elected Archbishop of Canterbury in 1093. He is a towering figure of medieval theology whose devotional work reveals the spiritual heart of all he does. My acquaintance with his writings is from The Prayers and Meditations of Saint Anselm, which you can read in a translation by Sister Benedicta Ward, and Anselm of Canterbury: The Major Works, including his Monologion, Proslogion, Why God Became a Man (or, Why the God-Man? — Cur Deus Homo), and others of penetrating philosophical and theological insight. St Hildegard of Bingen (1098-1179). St Hildegard is a famous mystic and female writer of the Latin Middle Ages. She was an abbess who had episcopal authorisation to preach and who corresponded with the famous churchmen of her age. She had visions from a young age which are recorded in her Scivias; she also wrote abundantly on a great many other topics and composed some beautiful music. The Scivias and the music are my main encounters with St Hildegard. Look her up on Spotify. Cistercians! A great entryway into High Medieval spirituality is The Cistercian World: Monastic Writings of the Twelfth Century, translated for Penguin by Pauline Matarasso. This includes selections from Stephen Harding, Bernard of Clairvaux, Aelred of Rievaulx, William of St Thierry, Guerric of Igny, and more. Worth your time. St Bernard of Clairvaux (1090-1153). St Bernard is considered by Cistercians as the Last of the Fathers. Besides the anthology above, I’ve read from his Homilies on the Song of Songs. So much of St Bernard is so good, and so much exists, it is hard to know where else to point. Jean Leclercq (1911-1993). Dom Jean Leclercq OSB was a scholar-monk, like de Vogué, of the highest calibre. I cannot recommend too highly The Love of Learning and the Desire for God. Thomas Merton (1915-1968). Trappists are Cistercians of the Strict Observance, and Thomas Merton is probably the most famous of them. His posthumous The Inner Experience from early this millennium had a strong impact on me, and many speak highly of New Seeds of Contemplation. I also found some random selections from his memoir, The Seven Storey Mountain challenging and inspiring (I found a copy lying around my parents’ house while in undergrad and dipped in and out unsystematically). Adalbert de Vogué (1924-2011). Dom Adalbert de Vogué OSB was an academic scholar-monk who wrote extensively on the monastic tradition. For our purposes, I recommend the English translation of The Rule of Saint Benedict: A Doctrinal and Spiritual Commentary. Important Benedictines of one order or another whose works I’ve not read: Benedict of Aniane (the second Benedict; I skimmed his list of monastic rules once), Hrabanus Maurus St Peter Damian, St Odo of Cluny, Blessed Peter the Venerable, Gilbert of Hoyland, John of Ford, Gertrud the Great of Helfta. Once I’ve read some of his theology, Lanfranc of Bec/Canterbury may also be recommended on this blog. In closing, one reason why we should concern ourselves with St Benedict’s Rule is not, perhaps, that it is the greatest or the most original monastic text. It probably is not. However, a rich tradition of theology and spirituality flows from it to our own day. This is reason enough to get to know it.